Water, Basil (18%), Maltodextrin, Salt, Sugar, Extra Virgin Olive Oil (6.8%), Vinegar, Citrus Fibres, Corn Oil, Thickener (Xanthan Gum), Basil Extract (0.07%). Add 1/2 teaspoon (5g) to 100 ml of soup, sauce, or vinaigrette to get a distinct flavour direction. For best results add when there is some liquid present - hot or cold - and stir or whisk thoroughly. 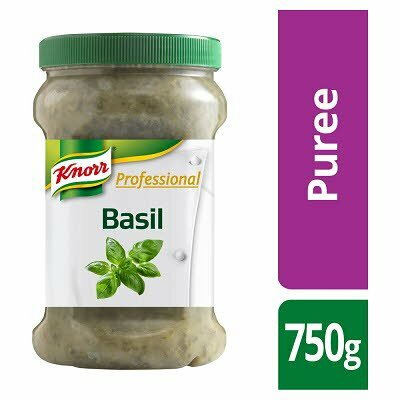 Professional purees can be added late in the cooking process just before serving or to cold dishes, unlike dry herbs and spices which need time to hydrate & soften. The puree contains high quality herbs and spices and water so for best results do not add direct into hot oil. Store in a cool dry place. Once opened keep closed jar refrigerated for best results and use within 3 months.